From the sea of saffron coloured robes and grand French-colonial architecture to buzzing city centres and rich wartime history, scratch the surface of Vietnam and Cambodia on this mindblowing 7 day tour. 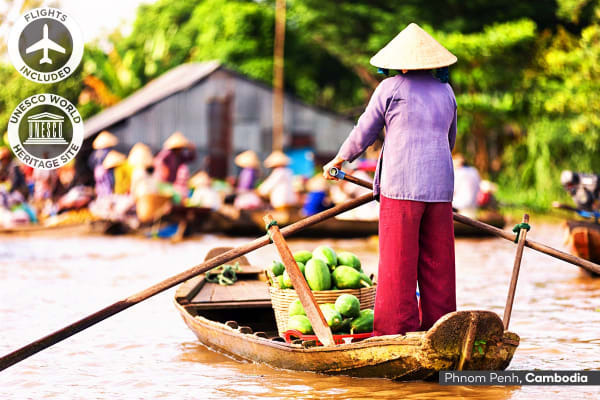 Immerse yourself in the sights, cultures, history and tastes of Ho Chi Minh City and Phnom Penh on this incredible 7 tour across Vietnam and Cambodia. Experience a day in the life of a Vietnamese soldier fighting in the Cu Chi tunnels during the Vietnam War in Ho Chi Minh City. 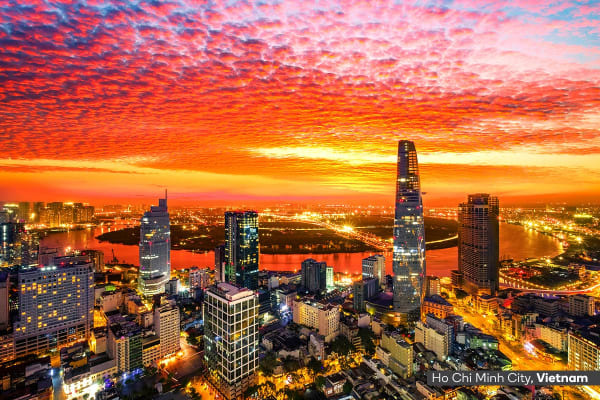 Gape in awe at the grandeur of Ho Chi Minh City with visits to the Notre Dame Cathedral and the iconic Saigon Post Office, timeless vestiges of the city’s rich French-Colonial heritage. Experience the sea of saffron monk robes, stunning architecture and aromatic streets of Phnom Penh, gaining insight into royal life with a visit to the breathtaking Royal Palace and the gleaming 5,000 pieces of silver at the Silver Pagoda. Experience some of Asia’s most energetic markets with visits to Ben Thanh Market in Ho Chi Minh City and the central market in Phnom Penh, basking in the zesty blend of herbs, spices and incense while shopping for souvenirs to take home with you. Pack your bags for a South East Asian adventure as your board your international flight to Ho Chi Minh City, the buzzing centre of Vietnam. 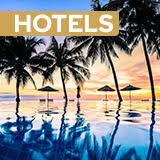 Upon arrival at the airport, you’ll be greeted by a tour representative and transferred to the hotel for check-in. Spend two splendid days in Vietnam’s lively capital, starting with a tour of the Cu Chi Tunnels where you’ll gain insight into the life of a tunnel-dwelling Vietnam War resistance fighter. Continue onto the War Remnants Museum before basking in the French-Colonial masterpiece of the Notre Dame Cathedral. Cap off your first day in Ho Chi Minh City with the scramble of the Ben Thanh Market. Spend today exploring the city at your leisure, perhaps wandering through the incense-infused temples and narrow streets from the back of a cyclos (3-wheeled taxi bike). 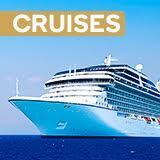 Mekong River Cruise (L) – Gain insight into life along the stunning Mekong. Cruise through riverside villages and lush rice fields before stopping at a local riverside restaurant for an authentic lunch prepared by a local family (AUD $109 per person). Say goodbye to Vietnam as you board your coach to Cambodia, stopping in Phnom Penh. Get a feel for rural life as you weave your way through farming villages and small towns abundant with stunning scenery. Start off your day of exploration with a visit to the Royal Palace Complex, the home of the Cambodian royal family and the breathtaking Silver Pagoda. 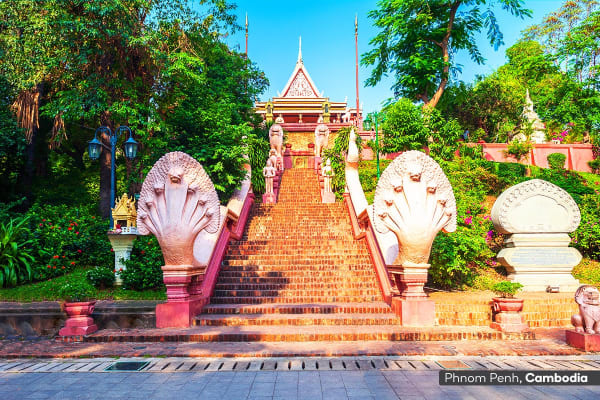 Admire gorgeous restored French-colonial architecture at the colonial headquarters and post office before continuing onto Wat Phnom Temple where you can enjoy panoramic views over the tree-lined avenues of the city. Finish off today with a visit to the central market where you can shop for local crafts and tastes! Guests need to dress moderately when visiting the Royal Palace. The palace may be closed in the event of special ceremonies or visits by heads of states. Spend today as you like, perhaps getting amongst the hustle and bustle of the city from the balcony of the iconic Foreign Correspondents Club with a drink in hand! Tuol Sleng Genocide Museum and Killing Field Tour (L) – learn about the atrocities of the Khmer Rouge regime with a visit to the Tuol Sleng Genocide Museum, followed by the sobering killing field. Top off the tour with some fresh local delights. Say goodbye to your travel buddies as you board your international flight home to Australia.